After three months of straight controversy and our hands-on impressions from PAX -- wherein Kat Pawlowski braved a Sony rep's comfort zone to get the scoop -- the Sony PSPgo is finally hitting store shelves. Gagdet lovers swoon and pennypinchers scoff! The loss of the UMD drive hits hard for some people, but others will appreciate being able to take your whole PSP game library with them. The biggest question of all becomes: is it worth the hefty price tag? We scoured the internet for reviews, and we cheated for you: we skipped to the ends of each article in search of the perfect round-up. Read on and tell us what you think. It all boils down to is this: PSP Go is a bad idea, but at least I can say it's a perfectly executed one. It's a sturdy, classier game system that we're not as shy about taking out of our pocket on long, public commutes. We really do like the portable, but there's no way to separate our feelings on the hardware from all the decisions surrounding the launch. [M]y beloved PSP sits on a shelf somewhere out of reach, a dusty artifact that I'll neither play nor throw away. The Go will not fare any better by being a little bit smaller or ditching pesky UMDs. PSP2, I'll be waiting for whenever you decide to show up and steal my heart again. This is a good machine, and it's key for Sony for it to be a success. However, in an age where our phones come with games libraries, and video and music playback, it does feel like it's come a year late to the multimedia party. Sony certainly has their heart in the right place -- technologically advancing mainstream handheld gaming to a purely digital plateau -- but it seems as if the idea wasn't fully realized when it comes to mainstream viability. 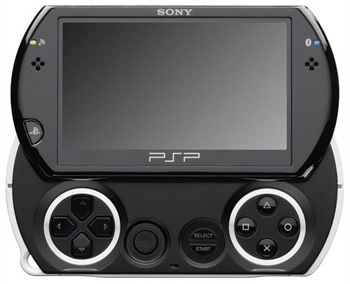 It seems to be pretty much agreed that the PSPgo is not so much an improvement over the PSP-3000 model as it is an alternative. There is something to be said for extra portability, but after three iterations, PSP owners are plenty well adjusted to the size and capabilities of the PlayStation Portable as it has already existed for nearly five years; there's really no need for less bulk if the price isn't right. If digital distribution is truly the future for portable games, then hopefully the hardware will become more affordable...or at least more reasonable in price. Until then, dive in AT OWN RISK. The PSPgo will be available at retail outlets on October 1st, MRSP $249.99. Order from Amazon.com to support Co-Optimus! Page created in 0.5866 seconds.